Compact and unaffected by weather, the 10x25 Blackwave Monocular from Carson Optical is easy to handle and compact enough for glassing on the go. Its 10x magnification is suited to mid-range observations, the field of view is a generous 273' at 1000 yards, and the 25mm objective lens and BK7 prism provide a bright image with plenty of contrast. Weighing 4.3 ounces and measuring 5 x 1.5", this waterproof optic will enhance sightseeing and outdoor recreation without adding much weight or bulk to your pack. The Blackwave ships from the manufacturer in clamshell packaging. 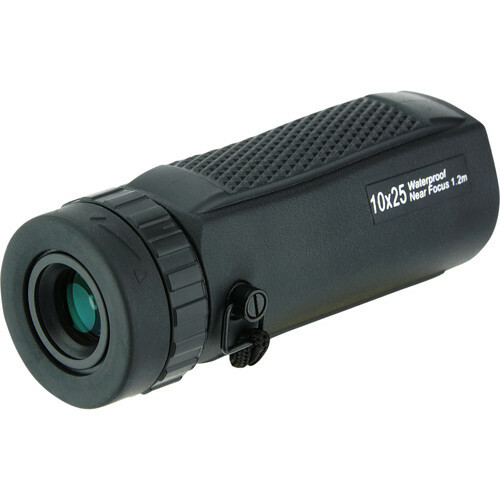 Box Dimensions (LxWxH) 9.0 x 6.35 x 2.85"
10x25 Blackwave Monocular is rated 4.0 out of 5 by 3. Rated 5 out of 5 by Peter from Good quality for the price For the price point, I was ready to accept you get what you pay for, for something intended for day time hikes and being pocket-able. However, I was pleasantly surprised. The quality of the build and the clarity of the glass makes this a bargain. The focus ring is well dampened, if not a bit stiff. Being new, it should loosen up a bit with use. The field of view is limited with glasses. The image is sharp from edge to edge. The waterproof housing is nice if caught in the rain. It comes with a nice stitched nylon case with belt loop. However, it also sports a decent, metal swivel eye hook, which is a good option if worn on a tether.